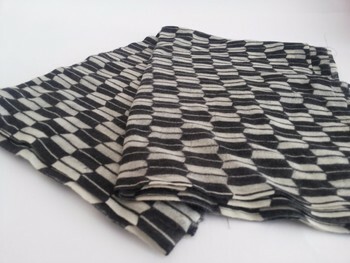 This ia a 100% wool fabric printed stole, black and white colour is a classic combination . 100 % pure wool scarfs & stoles. 1.Mfg & Export of Wide range of shawls and scarves. 100 % wool scarfs in printed pattern , woven in Kashmir , India. ABOUT U.S. : We are a licensed export company based in New Delhi , India with manufacturing facility located in Srinagar , Jammu and Kashmir , India. Our main product line includes a variety of shawls and scarves , as well as some other crafts from India . We cater to high-volume importers , distributors , retail chains and brands in large quantities, and also directly to boutiques / retailers in smaller quantities high end . Labeling BRANDS: We can design and stitch satin woven labels with your company or brand / logo with or without content and cleaning instructions shawls / Scarves for a nominal additional charge . COLORS : Colours can be chosen from our 340 color chart shade. We can provide a digital shade chart by email or a physical being , if necessary. We can dye the shawls or yarns to order. We also offer ready to submit sets of samples of up to twenty different models of fabrics that make shawls / scarves . This includes pure cashmere , silk and cashmere , silk and wool , pure wool , angora , rayon, and others. PAYMENTS : Payments : Below are the payment methods we accept: Bank transfer (bank transfer) to our business account at HSBC Bank or ICICI Bank > Documents against payment> Irrevocable Letter of Credit > Money transfer Western Union . SHIPPING : We ship worldwide by air or sea , as instructed by the buyer. For air shipments , we have discounted contracts with FedEx Express , DHL and TNT. For price quotes and further details , you are welcome to contact us.